HERE IT IS!!! After almost two years of data collection, processing, analysis and review, the hard work of our collaborating scientists and our team has been published about the species that has won the shark and diving community by storm: the great hammerhead shark. And the findings are incredible! When we supported the study of Bimini Biological Field Station – Sharklab by placing almost two dozen tags, both acoustic and satellite transmitters, we honestly did not expect the sharks to show so many impressive behaviours. Take for example one female (#13) whose detection showed annual return migrations from Bimini all the way up to South Carolina, coming back to Bimini and doing the same impressive swim once again in the following year. Great hammerhead #15 did a 3030km round-trip to Virginia and back to Bimini within one season! 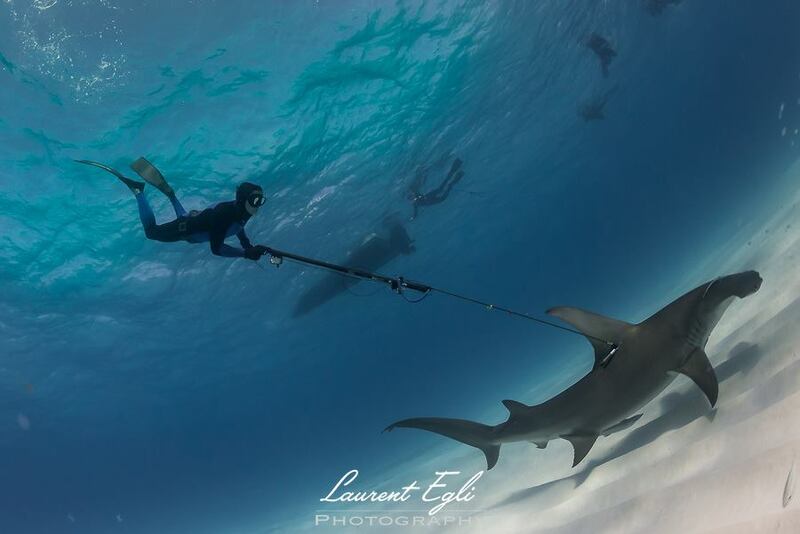 From seasonal residency, site fidelity, philopatry, regional connectivity, you name it, great hammerhead sharks are not only charismatic, uniquely evolved and shaped, incredibly fun to dive with, but also extremely accurate in their navigation and damn good swimmers. What does that mean for conservation? For fisheries management in the US it will be difficult to ignore some of these findings and the “no- to low-risk” classification will have to be reconsidered. Furthermore, the international migrations performed by the sharks in this study show the need of collaboration between the Bahamas and the US to ensure this important resource is being used sustainably. Last but not least, this is one of the first steps to being able to define essential fish habitats for great hammerhead sharks, which is crucial to improve the management of this species. We would like to thank everybody involved for their help and contribution to the project! Collaborating with Tristan Leonard Guttridge and his team was incredibly fruitful. William Winram and Lukas Mueller will return to Bimini this season for a follow-up project to further improve our understanding about this unique predator of the sea!